Merida the dog is nothing short of a miracle. She was shot twice with a .22 caliber and still managed to carry 8 puppies and give birth to them. Merida was so wounded she couldn't produce milk. Instead she was scrounging for scraps for her 8 puppies. Sign the petition to ask Lewiston officials to take this case of animal abuse seriously and find whoever shot Merida! Merida and her litter were found in a shed covered in bloody excrement. All the pups had canine parvovirus and two of her pups didn't make it. 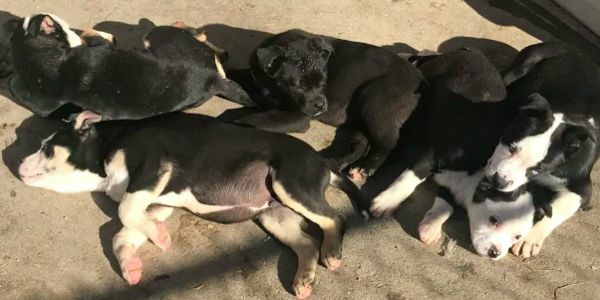 But Zeus's Friends, a local rescue, took them in and is working to rehab the six puppies and Merida. Apparently, even after being shot and nearly dying with her litter, Merida is an extremely happy and playful dog. She is a rhottweiller chow mix and gets along great with cats, people, kids and other dogs. The resilience of Merida and her litter is amazing. What's horrible is that whoever shot a pregnant dog is still out there. Please join me in demanding justice be done for Merida - ask local officials to find, charge and prosecute her shooter to the full extent of the law.